2016 was a roller coaster of a year. Finishing my PhD in August felt great, but as a life-long Cubs fan, watching the MLB postseason was nothing short of amazing. I started planning to cake the trophy immediately, of course, but events in the U.S. a week later took the wind out of my sails and I wasn’t up for actually making it until the home opener the following spring. 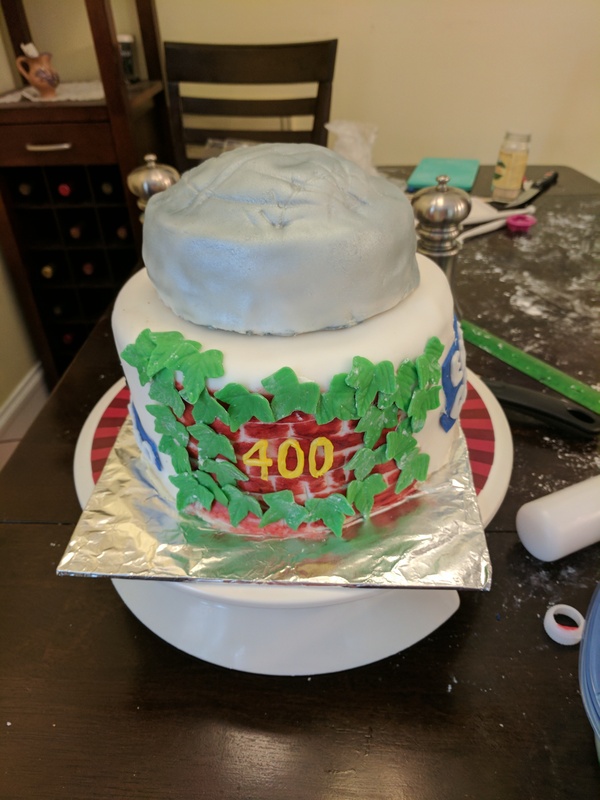 Over those few months I thought through a bunch of ideas, most of which I gradually revised downward due to constraints in time and talent when it actually came time to make it, but it still ended up being maybe my favorite cake ever (both artistically and emotionally). The winner of the World Series takes home the Commissioner’s Trophy. The design has changed slightly over time, but it features 30 flags (one for each major league team) on a round base with a baseball in the center that has latitude and longitude lines on it (to represent the World – by which we actually mean the U.S. and one city in Canada). The flags on the trophy stand pretty high, but there’s not much to the base, so I figured I’d set it on something so there would be more cake to eat. A model of Wrigley Field was exciting but impractical, as were a bunch of other ideas I had but can’t even remember anymore. 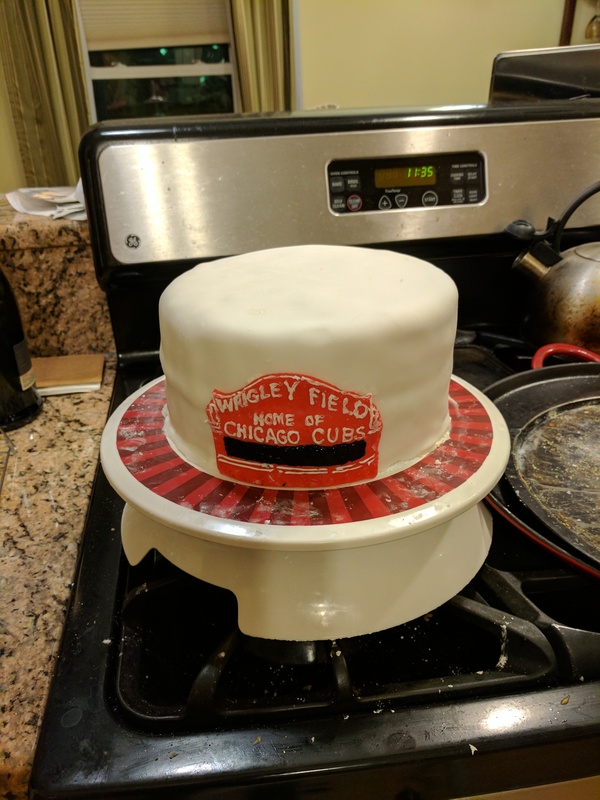 I decided on a basic 9-inch round layer cake (champagne cake, of course) with a single 6-inch layer on top for the actual trophy part. 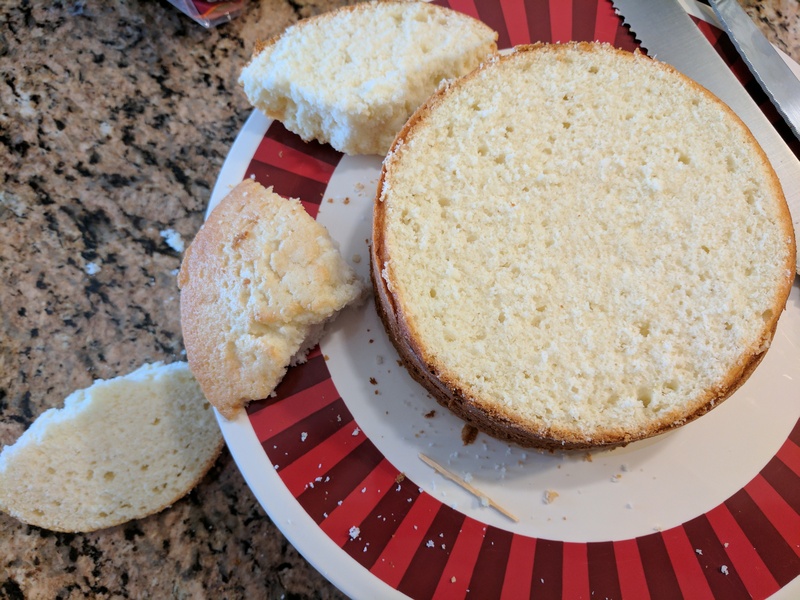 I need to remember to try a different champagne cake recipe next time. This one doesn’t do well in 2-inch layers, tending to be under-done in the middle. 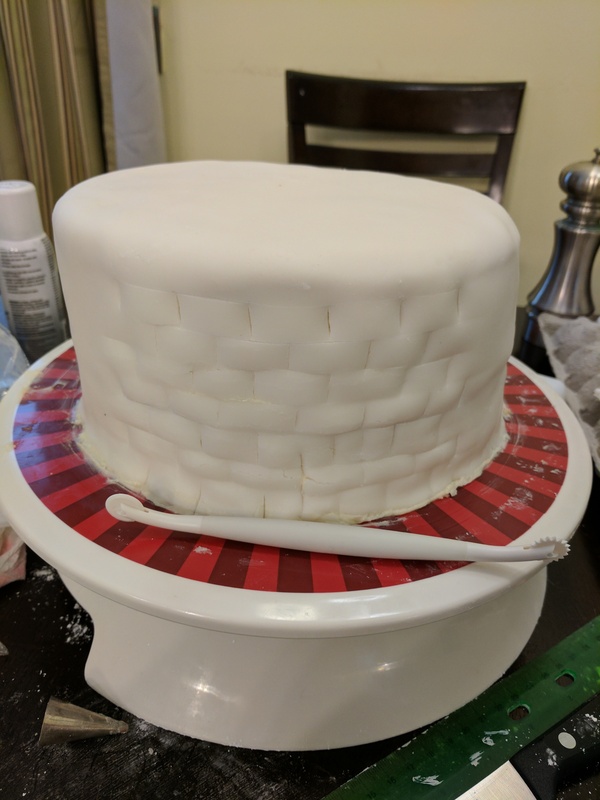 Huge pocket of under-done cake. I cut it out and filled it in with trimmings from the top layer. Must find a more reliable recipe. 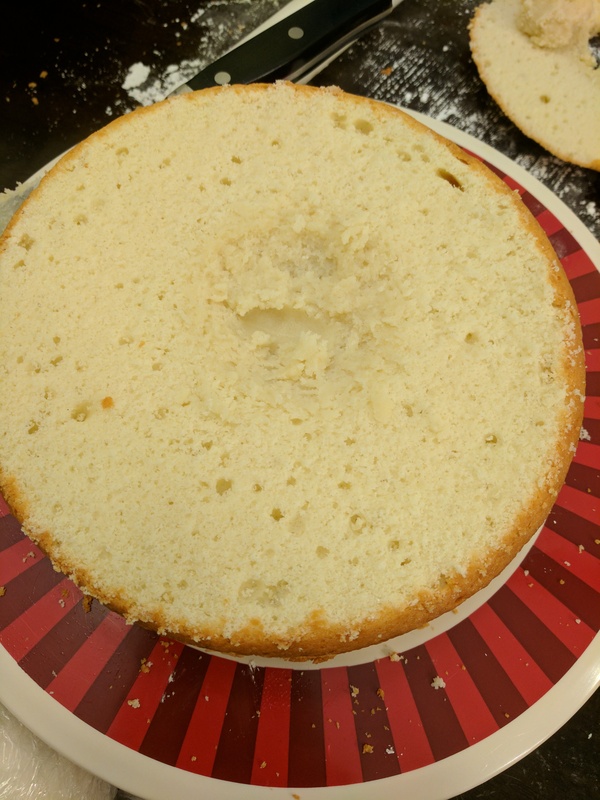 This time I didn’t use cake strips around the pan in the oven because I wanted the domed top to form the baseball, but as it rose, it cracked. 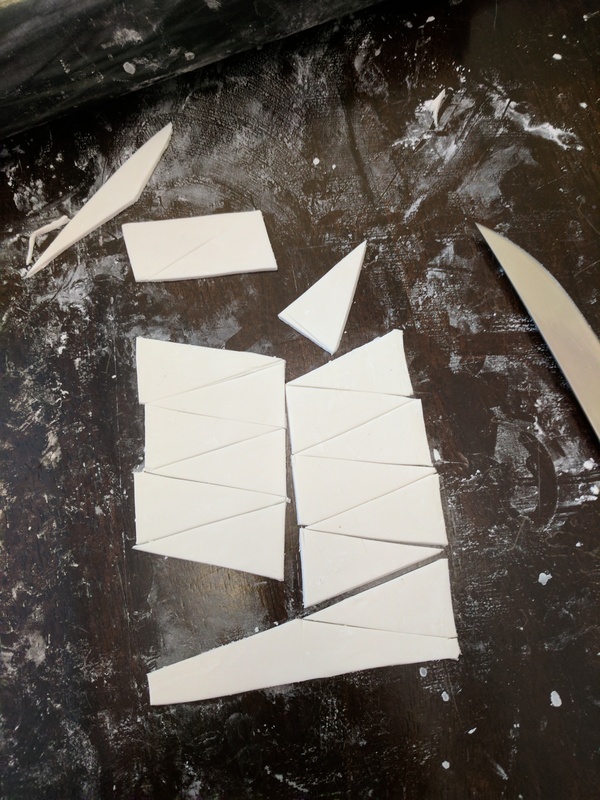 I sliced the dome off and reattached it, in pieces. This cake cracks when it rises. Huge, irreparable cracks. Don’t worry, fondant covers them. Then I covered the whole thing in white chocolate frosting and fondant. 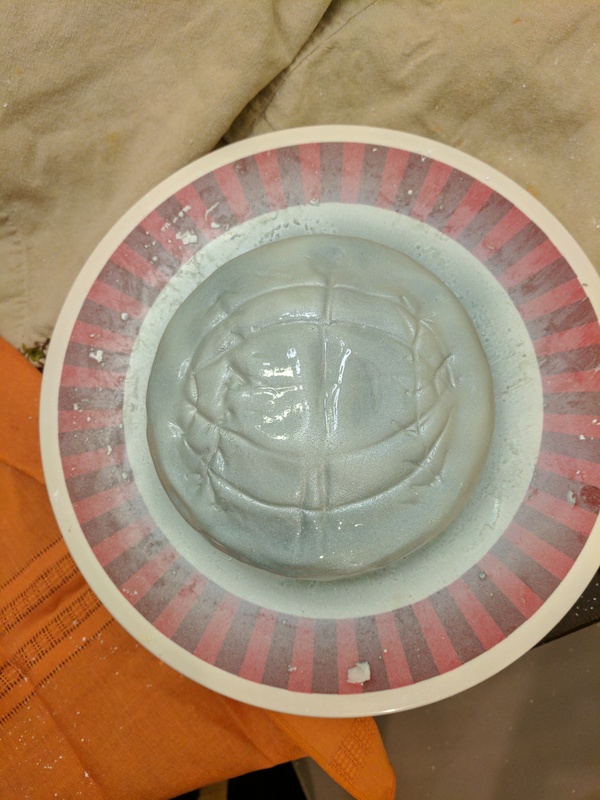 I drew the latitude and longitude lines poorly using one of my fondant tools, and corrected the mistakes as best as I could, which was not very well. Then I coated it with the silver spray left over from the Cup Cake and used a bit of gold pearl dust left over from the dogwood flowers to accent the stitches. I have no justification for why I couldn’t draw these lines. The flags were probably the biggest victims of my revising down of plans. I had grand ideas of caramel ribbons, and when I burnt the caramel in the test batch and didn’t have a solution for ensuring they would be straight and even anyway, I switched to looking for edible candy options. White chocolate, even tempered, would be too thin and also not likely straight. I couldn’t find candy sticks the right thickness. 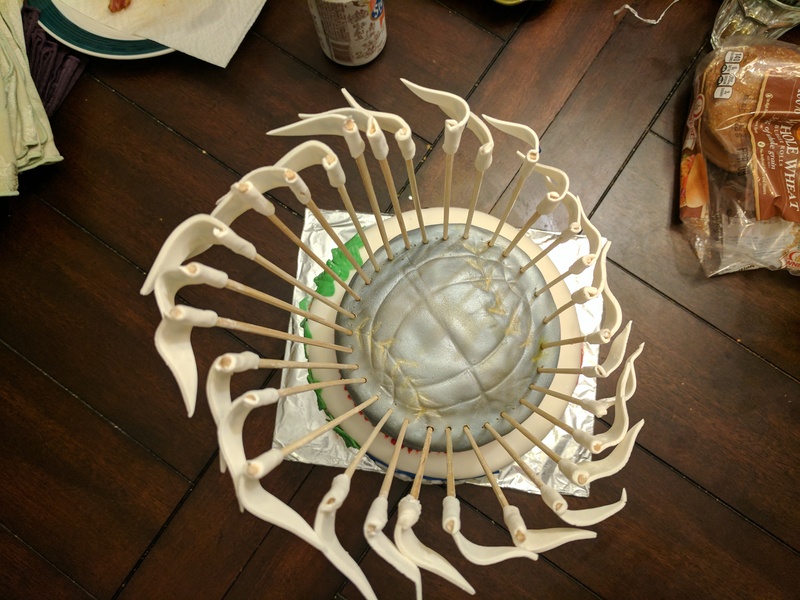 Google search and I couldn’t think of anything else, so I went to wooden kabob skewers. 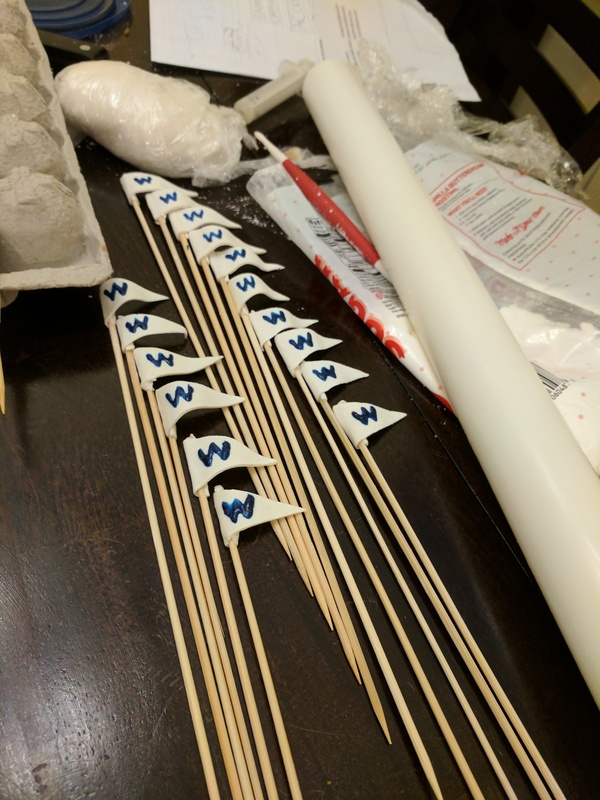 I realized these flags were a great opportunity to incorporate the iconic “W” flag (white field, blue W, flown over Wrigley to signify a Cubs victory that day). 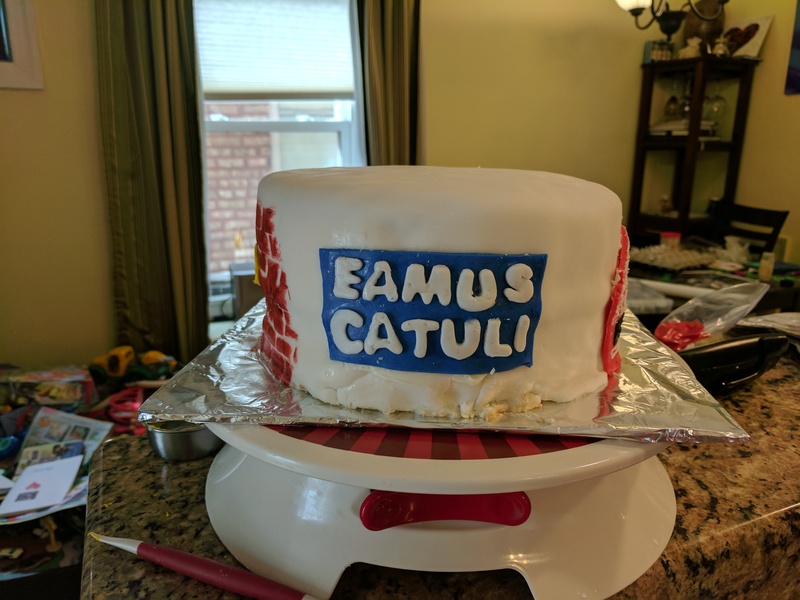 First I made some flags with gum paste that I didn’t measure to keep consistent, and I added W’s using premade blue fondant I’d inherited and cut with the Wilton alphabet cutters that had to be trimmed to approximate the correct font. They didn’t look good. Fortunately I have no pictures. Also fortunately, the cup they were stored in got knocked off the counter so most of them broke and I had to start over. I redid them with evenly-sized gum paste triangles and dark blue royal icing, and they looked much better, if you can forgive some lack of consistency in the W’s. I thought I might dip them in white royal icing to hide the wood, but I ran out of time. 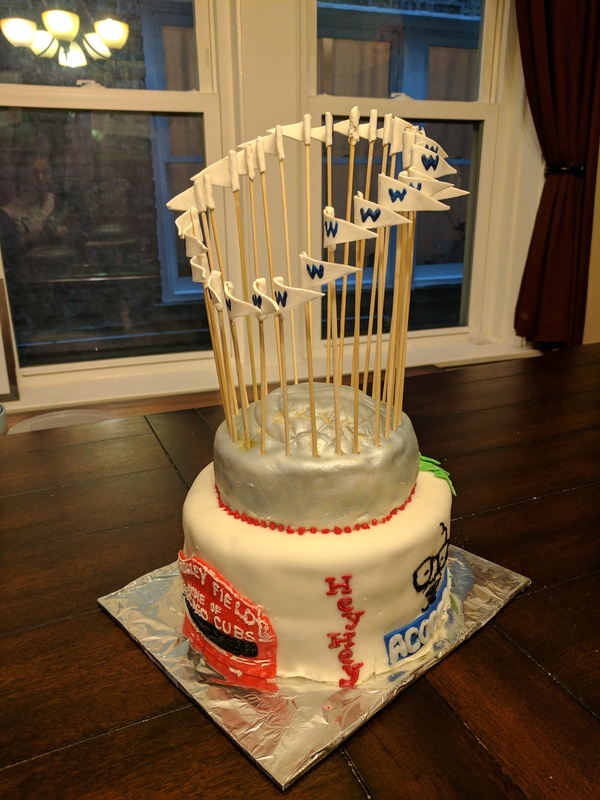 Three decades of attending Cubs games gave me plenty of ideas for decorating the base cake, and since I couldn’t pick a single one I decided to go with a collage of iconography. I’m not going to explain any of these to you. Go to Wrigley and see for yourself. Making the marquee was easy. 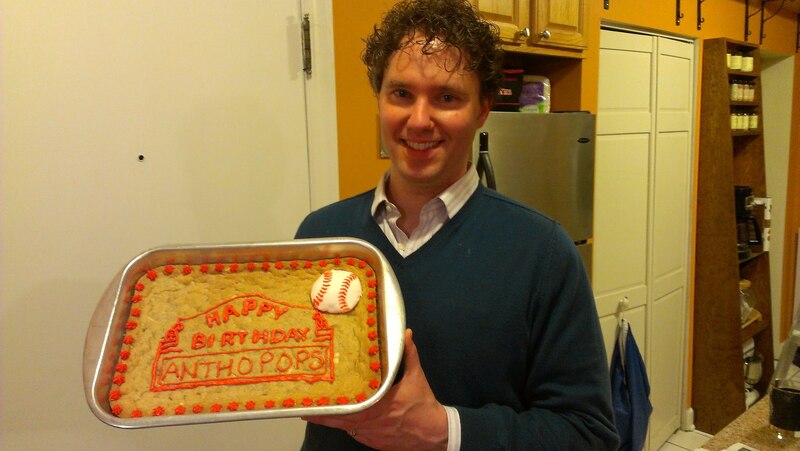 I’d even done it before as a cookie in 2013, one in a series of Cubs-themed birthday desserts for my husband. The iconic bricks and ivy were fun. 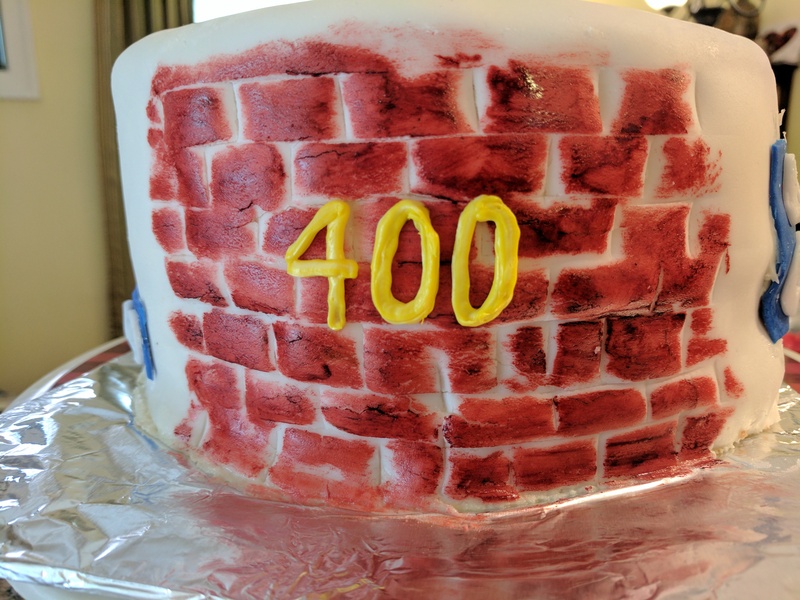 I scored the fondant of one section into a brick pattern and then painted over it with a combination of red and brown gel food coloring using a dry fan brush. The ivy leaves were white modeling chocolate. I would rather not have made the section so square, but once I’d scored it so evenly I was committed. Most of my freehand royal icing accents I was pretty happy with. The pieces I used the letter cutters for, though, didn’t look as good. I should have hand drawn the AC000000 sign and Eamus Catuli. 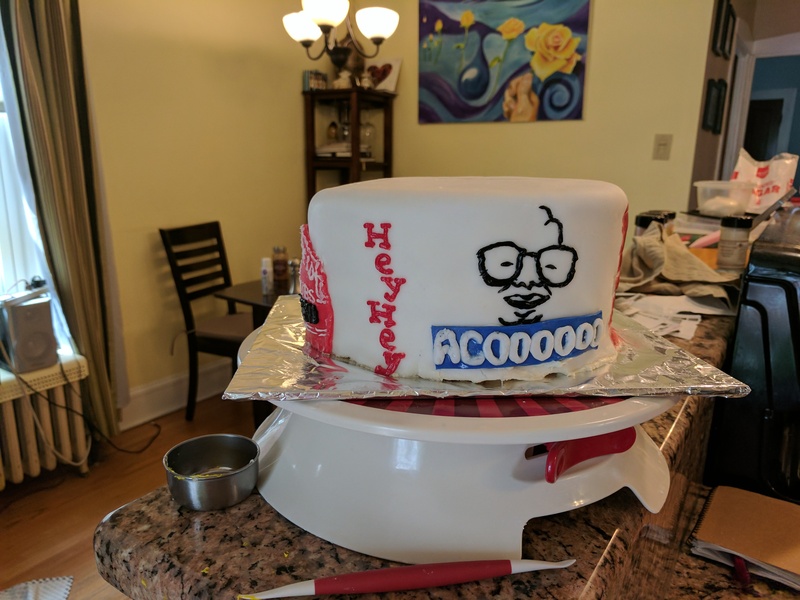 Still, though, my favorite cake ever. Enjoyed with a bunch of Cubs fans along with a cookout and a bunch of Old Style on the home opener of 2017.